You’re not going to hear from me for a bit. On Friday afternoon I’ll be leaving my site and won’t come back for 13 days. After being in Thailand for over a year and a half, I’m finally going to see the ocean. All those visions of Thailand that immediately come to your head from television shows, movies and postcards: I’m finally going to see that part of the country. 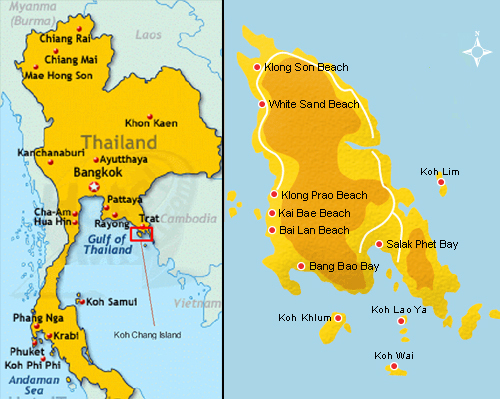 Erin and I are headed to the island of Ko Chang, which is just off the coast of the province of Trat. After that we’ll be heading to Bangkok for the Peace Corps Thailand 50th Anniversary celebration where we will have the privilege to meet the princess of Thailand. She’s a big deal over here. I feel honored. This is all you get for now. I’ll have pictures when I come back. After that I’ll be hanging out for the weekend in Bangkok before I go to the province of Suphan Buri for warden training. As warden, I’m in charge of contacting everyone in my region of the country in case there’s any kind of emergency (floods, monsoon, alien invasion). It’s 10 a.m. on Wednesday as I write this and I’m counting down the hours until my departure on Friday. Saturday, July 7: spend night in either Trat or Chantaburi, depending how tiring the buses are. Sunday, July 8: take a boat to the island of Ko Chang and sit on the beach until Wednesday. Wednesday, July 11: go to Bangkok, try not to get robbed or ripped off by taxi drivers and make our way to the Taewez Guesthouse. Smoothies will be consumed and an iron will need to be found to smooth our clothes before we meet the princess. Thursday, July 12: go the open house at the home of the American Ambassador to Thailand. Yeah, we’re cool like that. Friday, July 13: stand before a princess, meet volunteers from the past 50 years and wear a tie. Saturday and Sunday, July 14 and 15: Anything can happen in Bangkok. Monday, July 16: depart for warden training with fellow wardens Dan, Roger, Kristina, Tammy and Paul. Tuesday, July 17: complete warden training and make my way back home. This entry was posted in Peace Corps and tagged islands, peace corps, thailand by Jeff Jackson. Bookmark the permalink.